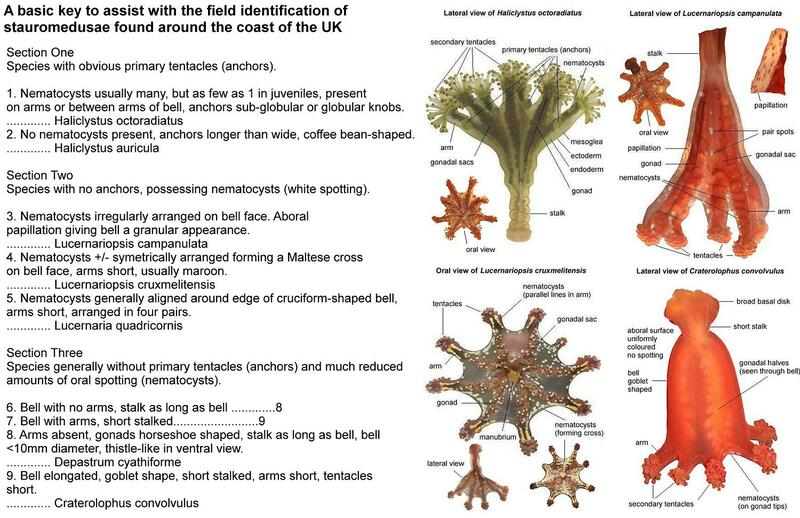 Stauromedusae UK - How many species of can be found in the UK waters? How many species of can be found in the UK waters? There are ten species of stalked jellyfish found in UK waters. The ten species here are representatives of four families; Craterolophidae (Craterolophus), Depastridae (Depastrum), Kishinouyeidae (Lucernariopsis) and Lucernariidae (Haliclystus, Lucernaria and Stylocoronella). Of the species mentioned above the most likely species people are likely to come across is Haliclystus octoradiatus, which has a fairly widespread distribution in the UK. The next most likely species people will come across are Calvadosia campanulata and Craterolophus convolvulus. Calvadosia cruxmelitensis is locally frequent in the South-west and also occurs in the Channel Islands. Lucernaria quadricornis is possibly a more northern species in the UK, but has been recorded from the Isles of Scilly. Strangely, there do not appear to be any records for Cornwall. Depastrum cyathiforme and Haliclystus auricula are probably widespread, but rare; possibly rarer still is Haliclystus salpinx, which has only been recorded once in UK waters, at Wifie Geo, John O' Groats, Scotland, in 2009. 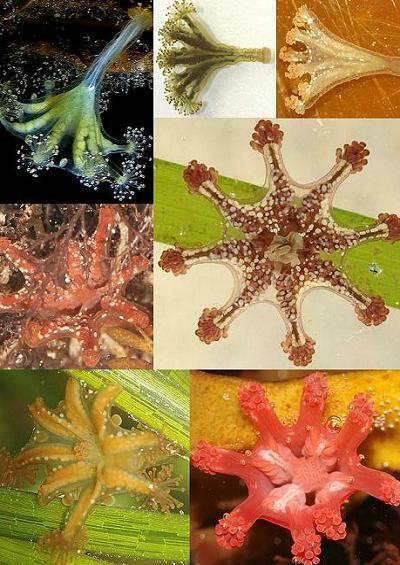 Of the ten, four species are protected by Biodiversity Action Plans (BAP), Haliclystus auricula including Haliclystus octoradiatus, Calvadosia campanulata and Calvadosia cruxmelitensis. 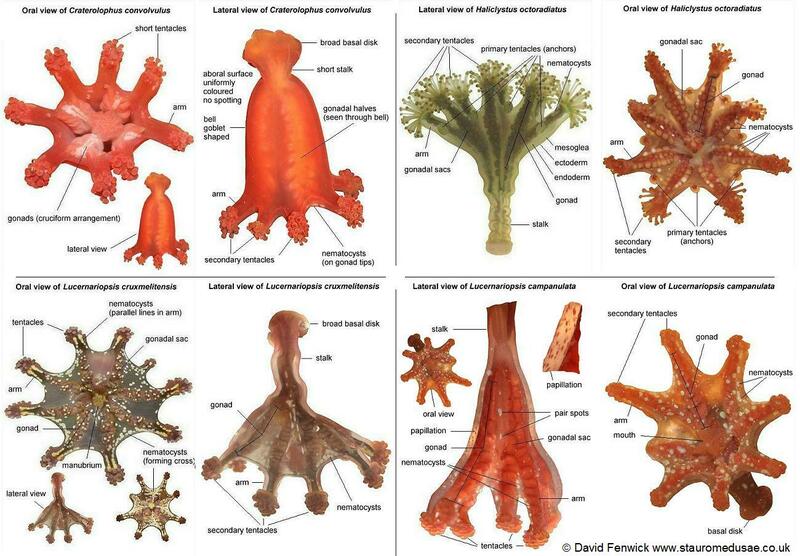 Guide to compare the four most common species of stauromedusae / Stalked jellyfish found around the coasts of Devon and Cornwall. Calvadosia campanulata, Calvadosia cruxmelitensis, Haliclystus octoradiatus and Craterolophus convolvulus. (jpg file, 200Kb). Images above are ©David Fenwick and may only be used for non-commercial / personal purposes.